Is Your Marketing Strategy Drowning in Bad Data? Perhaps you’re not asking the right questions! There is so much data out there, that in 2016 the world used one zettabyte of data; That’s a total of 1 trillion gigabytes. It’s getting easier and easier to collect information from your customers or even just the general marketplace, but why ask questions that aren’t going to help your business in the end? That doesn’t seem like a great marketing strategy does it? 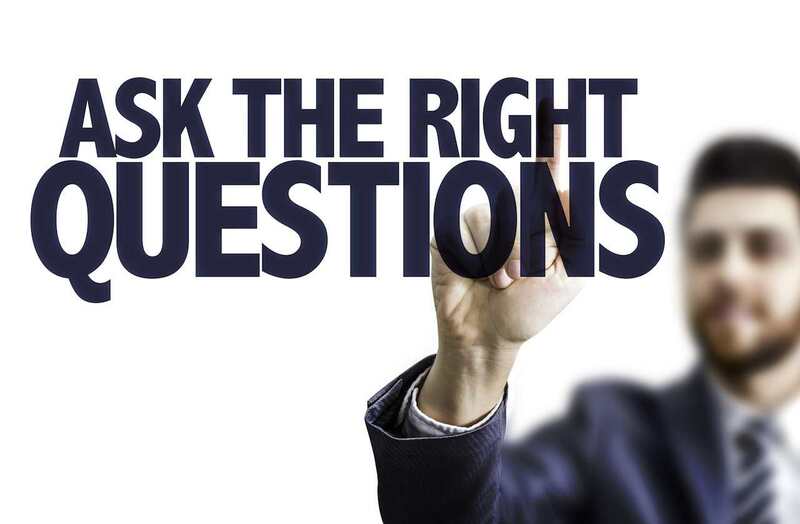 Asking the right questions becomes even more important, in an age when an overabundance of data can sap resources and mislead you on the effectiveness of your marketing strategy. Marketing questions need to be honed precisely. To extract just the right data for your business strategy so that you don’t waste time and money on data that is meaningless or worse, misleading. Instead, focus on generating questions that help in three different stages of the business process: prospecting, resulting actions, and bottom line questions. Understanding consumers on these levels is key to creating and implementing a marketing strategy that works. Who Is My Ideal Customer and Why? Now a days, there’s just so much information that you need to know about your ideal clients. Things like exact demographic, gender, age, income level, educational level, and even ethnicity. All of that data and more, compiled together can help you narrow down the psychology of your best buyers. Who are my ideal consumers and what are they doing during their day? What are the issues that are keeping them up at night? In this busy world, what captures their attention the most and why? What keeps them coming back for more? How do I see them behaving when they are marketed in certain ways? The better you are at predicting their motivations and actions the better you can create campaigns that engage and trigger them into actions that lead to better sales. These are normally titled “deliverables.” When you start a marketing campaign, you should have some idea of how many people you want to reach. It would also be nice to know how many new or repeating sales are generated, and how much you’ve strengthened your brand or reputation in the marketplace. Which emails have a better click-through rate and why? Are my customers engaging with my messaging? Why is one campaign more appealing and makes more sales than another? Using this data, how do I improve open rates, click-through rates, and sales? What action do I want my prospect to take and how can I trigger it? Obviously, just having the number of email reads, link click-throughs, and sales via your marketing research doesn’t answer these more in depth questions. For that, you need to do some actual market research and testing. Split-testing your results can give you the answers to these questions and more. You may find some email headlines are more appealing. Thus changing that aspect for 50% of your emails, until you generate the response you want is one way to find out what triggers your audience to read your emails. Another way to split-test click-throughs is to change the actual link text. Test on the link text in 50% of your emails and then see which was clicked-through the most. The same can also be done for a variety of marketing content, including landing pages. Then, check the generated statistics to see if they match your predictions. This is one way to use the data you are already getting to understand the underlying psychology of what triggers your audience in beneficial manners. These types of questions also tend to deal not just with current issues, but also the future vision and direction a company may choose to take to stay relevant. Am I collecting the right data to understand how my bottom line is impacted? When marketing to the right age demographic are we meeting the needs of our consumers? How are my competitors doing and what can I learn from them to improve my bottom line? Is my business flexible enough to weather risks and changes in the marketplace without folding? Is my business positioned for future growth? This type of marketing research has an element of insight and investigation that need to be implemented to get a good idea of the answers. You will want to understand how you are doing in the marketplace, in terms of market share, as compared to your competitors. You will need to have insight into where the market is headed in the future and which technologies and issues will be more likely to impact the bottom line in your industry, so as to ride the curve to better profits. Asking the right questions is not so much about statistical analysis as it is about the psychological mindset of the consumer and the trends in the marketplace and your industry. When you hire a market research firm, or digital marketing agency to help you with your marketing strategy, keep in mind that anyone can offer statistics. However, it’s those companies that can offer helpful advice on appealing to your target audience and how to be current on consumer and market trends. By asking the right questions, that will end up improving your bottom line. Click here to Join over 5,000 businesses!